It's finally here. I'm officially retired. 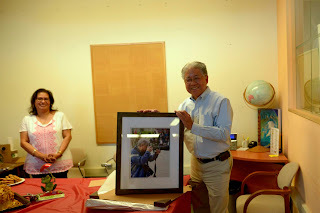 This is a copy of a framed photograph presented to me during a "cake and coffee" get-together held on June 29, my last official day in the office. The photo was made by my friend and assistant Cissie while I was concentrating on something off in the distance. The sendoff came as a complete surprise to me. I was touched by the number of people who showed up, and by the Blum's Coffee Crunch Cake (an office favorite introduced by yours truly) so thoughtfully provided. It was just the right size, just the right sentiment, and just the right moment to cap my 32 year career with the Adult School. For now, I'm going to begin the slow acclimation towards a schedule that includes only the things I want to spend my time on. 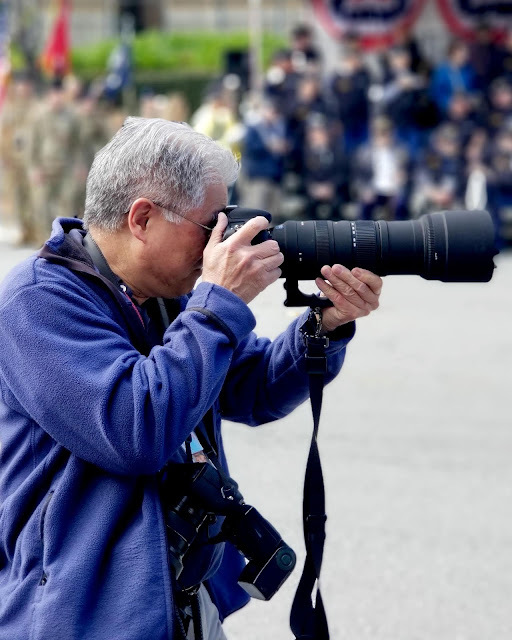 There is much to do, most notably the removal of years of accumulated photo equipment from my office to my home, a Herculean task if one thinks of my cubicle as King Augeas' stable, and all my equipment as the you-know-what.